Current areas of research include the development of improved genetic tools for cyanobacterial genetic engineering and the use of these tools to answer basic-science questions and for biotechnology applications. Our biotechnology-related research involves genetic engineering of cyanobacteria to synthesize bioactive natural products and biofuels. Other projects include identifying cyanobacterial genes related to resistance to grazing by amoebal and ciliate predators, the study of genes required for biosynthesis of cyanobacterial toxins, and the identification of cyanobacterial genes that affect fitness for growth during spaceflight or on Mars. These research projects include work with different strains of cyanobacteria, but focus on the laboratory model strain Synechococcus elongatus, strain PCC 7942, which has excellent genetics and is widely used for synthetic biology studies. Past research has focused on the developmental biology of cyanobacterial heterocyst formation, with an emphasis on the genetic regulation of cellular differentiation and the cell-to-cell signaling mechanisms that control multicellular pattern formation. This research uses methods of genetics and molecular biology to understand basic principles of regulation and signaling pathways that control development in a simple prokaryotic multicellular organism, the filamentous cyanobacterium Anabaena (Nostoc), strain PCC 7120. Like all cyanobacteria, Anabaena uses light energy for photosynthesis. 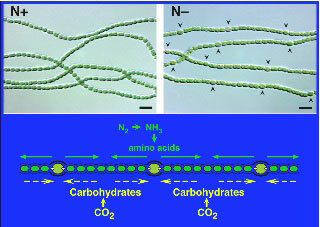 Anabaena is also capable of nitrogen fixation, a process that is incompatible with photosynthesis because the nitrogenase enzyme is destroyed by oxygen, a byproduct of photosynthesis. Anabaena solves this problem by spatially separating the two processes into different cell types: photosynthetic vegetative cells and nitrogen-fixing heterocysts. Anabaena grows as a very simple multicellular organism composed of filaments of vegetative cells containing about 10 percent heterocysts. Heterocysts differentiate from vegetative cells at semiregular intervals along the filament and supply fixed nitrogen to neighboring vegetative cells to support their growth. We identified a gene, patS, which encodes a small peptide that functions as a diffusible cell-to-cell signal that acts to control heterocyst pattern formation. Flaherty, B. L., F. Van Nieuwerburgh, S. R. Head, and J. W. Golden. 2011. Directional RNA deep sequencing sheds new light on the transcriptional response of Anabaena sp. strain PCC 7120 to combined-nitrogen deprivation. BMC Genomics, 12:332. Kumar, K., R. A. Mella, and J. W. Golden. 2010. Cyanobacterial heterocysts. Cold Spring Harb. Perspect. Biol. 2009. 2:a000315. Neunuebel, M. R. and J. W. Golden. 2008. The Anabaena sp. strain PCC 7120 gene all2874 encodes a diguanylate cyclase and is required for normal heterocyst development under high-light growth conditions. J. Bacteriol. 190:6829-6836. Aldea, M. R., K. Kumar, and J. W. Golden, 2008. Heterocyst development and pattern formation, p. 75-90, In S. C. Winans and B. L. Bassler (eds. ), Chemical Communication Among Microbes. ASM Press, Washington, D.C.
Aldea, M. R., R. A. Mella, and J. W. Golden, 2007. Sigma factor genes sigC, sigE, and sigG are upregulated in heterocysts of the cyanobacterium Anabaena sp. strain PCC 7120. J. Bacteriol. 189:8392-8396. Wu, X., D. W. Lee, R. A. Mella, and J. W. Golden. 2007. The Anabaena sp. strain PCC 7120 asr1734 gene encodes a negative regulator of heterocyst development. Mol. Microbiol. 64:782-794. Carrasco, C. D., S. D. Holliday, A. Hansel, P. Lindblad, and J. W. Golden. 2005. Heterocyst-specific excision of the Anabaena sp. strain PCC 7120 hupL element requires xisC. J. Bacteriol. 187: 6031-6038. Liu, T., J. W. Golden, and D. P. Giedroc. 2005. A Zinc(II)/Lead(II)/Cadmium(II)-Inducible Operon from the Cyanobacterium Anabaena Is Regulated by AztR, an alpha3N ArsR/SmtB Metalloregulator. Biochemistry 44:8673-8683. Khudyakov, I. Y., and J. W. Golden. 2004. Different functions of HetR, a master regulator of heterocyst differentiation in Anabaena sp. PCC 7120, can be separated by mutation. Proc. Natl. Acad. Sci. USA 101:16040-16045. Dr. James W. Golden received a B.S. (1977) in Microbiology from the University of Maryland-College Park and a Ph.D. (1983) in Biology from the University of Missouri-Columbia. After postdoctoral work as an NIH Fellow at The University of Chicago, he joined the Department of Biology at Texas A&M University in 1986. He was promoted to Associate Professor in 1990 and then to Professor in 1996. Dr. Golden moved to the University of California, San Diego in 2008.